I have been teaching teens to write for a quarter of a century (Twenty-five years just sounds longer when you put it that way, doesn’t it? ), and the online writing instruction service I founded, WriteAtHome, has been in business for a dozen years. In all that time we’ve learned a lot about how to teach writing effectively. 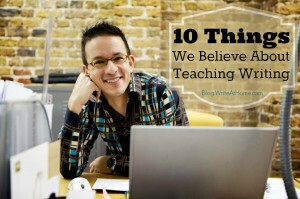 Here are ten of the most important things we’ve learned. There is only one way to learn to write – by writing. WriteAtHome courses require weekly assignments from students. We don’t want to overwhelm them, so we give students just enough writing to keep them honing their skills week in and week out. 2. A good writing coach makes all the difference. WriteAtHome writing coaches are the core of our program. Our team is made up of experienced teachers, writers, and editors – people with a love for language and a passion to help kids reach their writing potential. Our success with emerging writers is primarily due to the excellence of our writing coaches. 3. Sometimes it’s a disadvantage to be a parent-teacher. Of course there’s nothing wrong with being a parent, and home educating a child is a noble and worthwhile undertaking. It’s just that students are often more willing to hear constructive criticism from an objective third party — someone anonymous and emotionally distant. Many parents who use our services are exceptional writers and know enough to coach their own students, yet they see the advantage of input from a not-mom or not-dad. Most people struggle to write well, even professional writers. Certainly this is true of the average teenager. We get that. Good writing requires an odd mix of creativity, passion, and clear thinking, not to mention knowledge of the bewildering rules of grammar, syntax, and mechanics. Our coaches work patiently and sympathetically with all student writers. We know that growth in writing skill is normally incremental, over time. 5. You’ve got to keep it interesting. We work hard to provide students with engaging, memorable lessons about writing and with writing assignments that are creative and varied. We mix it up, giving kids experience with both creative writing and the more mundane academic writing that most of us are used to. Not every student likes every assignment, but most students end up enjoying most of them. Having worked with thousands of students over many years is a great advantage. We know what to expect from student writers – how to push the good ones and inspire the reluctant ones. Over time, you get pretty good at spotting common problems and equally good at providing solutions and suggestions. 7. Make sure nobody fails. That’s right. Nobody. There is no passing or failing a WriteAtHome class. We provide detailed assessment scores on final drafts, but no grades. Our goal is nothing more than improvement. We are not a school or an accredited institution. It’s not about pleasing a teacher and meeting his or her expectations. Our program is all about helping individual students develop their unique skills. There is no high bar to jump over; the only goal is to finish each class a bit better than when you started it. We work with students at all levels of ability with the same goal – to help them grow as writers. We have a history of success with struggling, reluctant writers as well as with talented future authors. We do not seek to fit students into a mold or expect them to meet some arbitrary standards. We customize our instruction student by student, paper by paper. Our coaches are not red-pen wielding authorities that students are trained to appease. They are caring tutors with a sincere desire to see each young writer reach his or her potential. We reject the old-school model of red-ink spattered papers full of blunt, harsh criticisms. We correct errors, sure, but we also think it’s valuable to point out what students do well. And when correction is offered, it’s with a warm, friendly tone. Noting what you do well can be just as instructive as learning what you’ve done wrong. Our coaches excel at noticing the good stuff. Flexibility and structure: we think you can have both. Weekly due dates are important to keep students on track and consistently working, but we are happy to work around the busy schedules of the average homeschool family. We expect papers to arrive on time, but we understand that unexpected things happen and that the freedom of homeschooling can result in regular interruptions of the school year. We find a way to make it work for every family. I could probably add more, but ten is a good, round number, so I’ll leave it there. I hope these ten ideas are helpful to those who teach young writers, whether they are your own kids or not. If WriteAtHome can be of assistance in this important area, please take a moment to visit our website. Our annual courses begin each fall, with enrollment starting as early as February, but our 8-week workshop sessions run throughout the year. Your comments and/or questions are always welcome. Leave yours in the reply section below. My son, a senior in high school, is taking English at the local university for dual credit. He enrolled in WAH about four or five years prior. He likes to write, just to give you a glimpse of his personality. This English class is a bunch of reading boring articles about boring things, then writing rhetorical analyses of those articles. His first paper he got a 90 but the teacher said he needed to talk more about the effectiveness of each strategy, and not critique the article. The next paper he thought was much better than the first because he thought he’d followed the assignment better. That time he got an 80. The paper he turned in today was on mandatory spay and neuter ordinance for pets that our city just passed. Rather than having the students write a persuasive argument either for or against the ordinance, they had to read someone else’s paper about a similar law in another city and evaluate whether that person is convincing, and why or why not. During peer review sessions, none of the other students in his group understood the assignment. When my son asked the teacher to explain a certain point again, the teacher answered rhetorically! 😉 That’s one thing he does ALWAYS. He asks a question of the class. Someone submits an answer, and teacher in response asks a question such as: what do you mean by that? It’s very frustrating for my son. Yesterday I asked him if he had finished his paper and he said, “I thought English would be more like Write At Home.” So, I want to pass along a tale from the field. You all are doing a great job, and I still recommend WAH to all my home school teacher friends. Totally agree. Thanks for the review, Brian– a good reminder for all of us writing coaches! Great quote. Thanks, CJ. (I’m sure glad you translated it too, my Latin is a bit rusty).